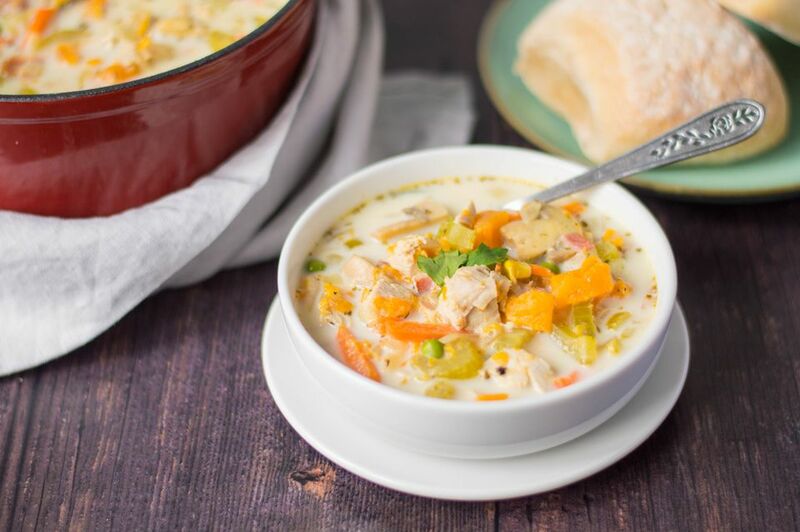 Leftover turkey teams up with sweet potatoes, mixed vegetables, bacon, and optional mushrooms in this great-tasting soup. Half-and-half makes for a richer soup, but you can use a lower-fat milk or light cream if you prefer. Aside from the chopping and cubing, there are very few preparation steps in this soup. Just simmer until it's done! If you don't care for mushrooms, by all means, leave them out. Add a little more turkey or vegetables if you like, or add a replacement vegetable. A little pimiento would add some extra color to the soup. Finely-diced ham would make a delicious substitute for the bacon. In a Dutch oven, stockpot, or large saucepan, combine the cubed sweet potatoes with the celery, onion, and turkey stock or chicken stock. Add the dried leaf marjoram and thyme. Bring the pot to a boil over medium heat. Turn the heat down to low, cover the pot, and simmer for about 20 minutes, or until the vegetables are tender. Add the mixed vegetables and simmer for 5 minutes longer. Add the diced cooked bacon, cubed turkey, and mushrooms to the pot; continue cooking over low heat for about 5 more minutes. Add the milk, half-and-half, or light cream. Taste and add kosher salt and freshly ground black pepper, to taste. Continue cooking until the soup is hot and just begins to simmer again. Serve the soup with crackers or crusty rolls and a tossed green salad. Use 3/4 teaspoon poultry seasoning in place of the marjoram and thyme. To cook the bacon in the oven, heat the oven to 375 F. Line a rimmed baking pan with foil. Place a rack in the pan and arrange the strips of bacon on the rack. Bake for about 25 to 30 minutes, or until crisp. Drain on paper towels and then dice for the recipe.